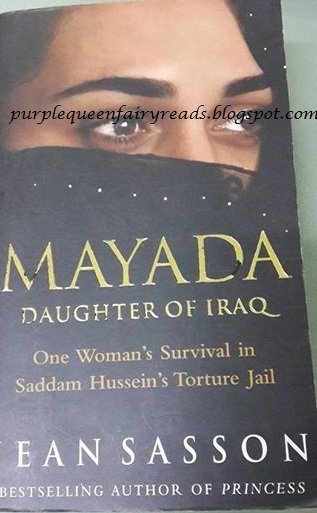 A member of one of the most distinguished and honored families in Iraq, Mayada grew up surrounded by wealth and royalty. But when Saddam Hussein’s regime took power, she was thrown into cell 52 in the infamous Baladiyat prison with seventeen other nameless, faceless women from all walks of life. To ease their suffering, these “shadow women” passed each day by sharing their life stories. Now, through Jean Sasson, Mayada is finally able to tell her story—and theirs—to the world. By the fact that I am having this post, you might probably would have guessed that I brought this title with me on a recent holiday. Mayada, Daughter of Iraq is a real story...pretty much an autobiography and I am always caution in reviewing such books. I mean, who am I to review what a person has gone through and say that it's a good read or otherwise. All I want to say about Mayada is that I am humbled by her. It is heartbreaking and I was quite reluctant to continue at times but yet,I want to know what happened to her and the other women. I got to find out what happen to her but not so much the other women in the cell. I think neither did she. Books without k become boos! !